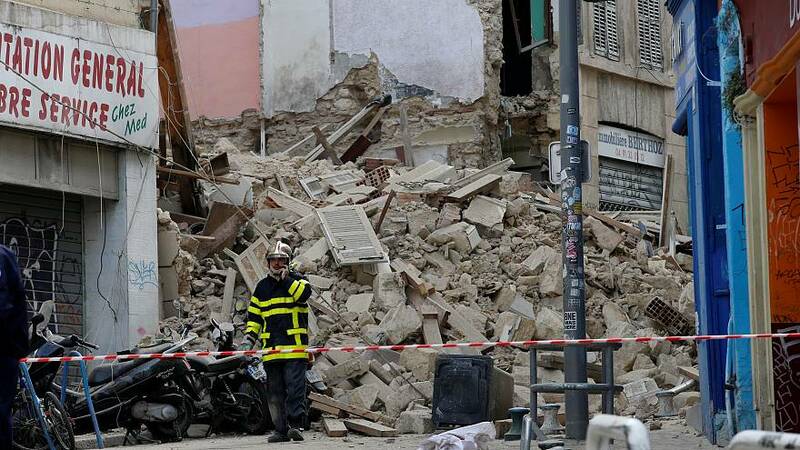 A third body has been found in the wreckage of two buildings that collapsed in the southern French city of Marseille on Monday. Emergency services made the discovery early on Tuesday afternoon. It means two men and a woman have so far died in the incident. Up to eight people are feared buried in the debris, according to Xavier Tarabeux, Marseille's public prosecutor. The buildings — one condemned and the other containing apartments — gave way around 9am CET on Monday. In the spot where they had stood, a large gap appeared once the dust and debris settled. Throughout the night, emergency services scoured through the 15-metre deep rubble. “There’s not much chance that we’ll find pockets where anyone might have survived,” said France interior minister Christophe Castaner. Images of the buildings before they collapsed, visible on Google Street View, showed that one of the buildings was clearly in poor repair, with boarded-up windows and large visible cracks on the facade before it collapsed.